ComponentOne DataSource™ for Entity Framework simplifies data binding by improving design-time support as well as by solving common problems related to loading, paging, filtering, and saving data. It also provides performance enhancements like data caching and asynchronous data virtualization for navigating infinitely large data sets. 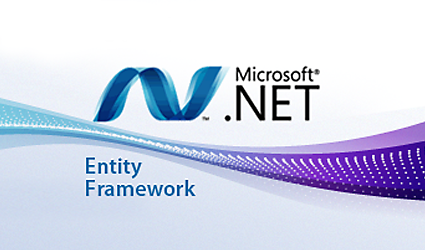 For WinForms, DataSource supports the latest version of Entity Framework along with its new, simpler DbContext API. You can use any development workflow — like Database First, Model First and Code First — to generate data models that are compatible with DataSource. The DataSource component makes Entity Framework data sources look like the traditional WinForms data sources you are familiar with. It allows you to data bind your views directly on the designer surface with easy-to-use property dialogs and very little code to write. Apply server-side filter, sort, and group descriptors quickly at design time. If you prefer to do everything in code, you can still do so using the rich data class libraries. 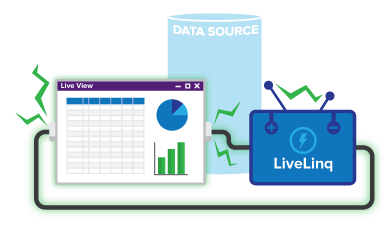 ComponentOne DataSource™ includes LiveLinq, an extension library which augments the functionality of LINQ to speed up queries and provide live views. With LiveLinq, you can shape your view however you want using LINQ operators without losing full updatability and bindability. "Bindability" means that your views are "live" and automatically reflect changes in the data. Your query results are kept up-to-date without re-populating every time changes in your data occur. Simplify programming with the widely-adopted Model-View-ViewModel pattern known as MVVM. 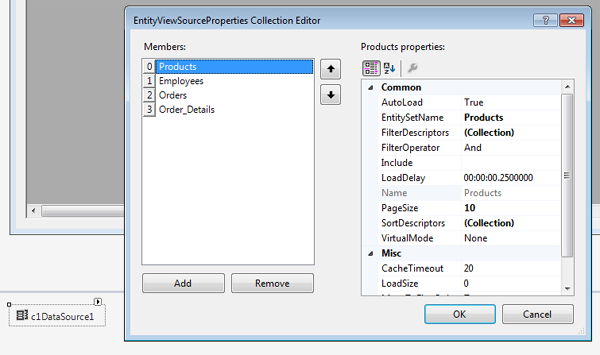 DataSource is the easiest way to build a WinForms application following MVVM. 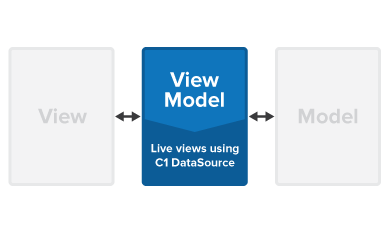 While developing MVVM applications typically requires much more code because of the additional code layer, the ViewModel, and the synchronization between the Model and ViewModel data members, you can minimize your needed coding with DataSource. Use live views as your ViewModel and without needing to worry about writing any synchronization code. Live views are synchronized automatically with their sources and are much easier to create. Virtual Mode technology allows you to navigate through infinitely large data sets asynchronously. 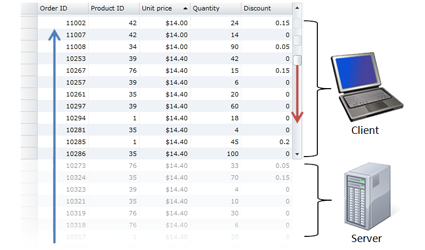 It works like paging on the data layer, but the user can scroll through the data as if all rows were on the client. As the user scrolls, chunks of data are retrieved from the source page by page and disposed of as necessary. You can use Virtual Mode with various UI controls like the standard DataGrid or FlexGrid. This feature is transparent to the developer; you can turn on Virtual Mode with one simple property setting. The key to most of these features is the built-in client-side data cache. DataSource maintains a cache of entities on the client. When new queries are executed, it checks the client-side cache first and will not go to the server if it can find the result in the cache. By minimizing the number of trips to and from the server, client-side caching significantly improves performance and speed.